Prestige Austrian optics manufacturer SWAROVSKI OPTIK has announce a radical new redesign of the spotting scope with its modular ATX / STX modular scope system. The new design incorporates two eyepiece modules (offering a straight or angled wide-angle zoom) and three detachable, interchangeable objective lens section. This radical redesign allows Swarovski to bring its the legendary field-flattener technology (dubbed Swarovision), that it employs in its flagship EL binoculars, to its new scope lineup. Aimed squarely at birding and wildlife enthusiasts and professionals the system boasts 65mm(25-60x) , 85mm (25-60x) and 95mm (30-70x) bayonet-fitting objective modules that allow you to change your scope to suit different birding /viewing demands as easily as you’d change lenses on your SLR camera. That’s some claim… but the Swarovski ATX / STX certainly looks like a ground breaking product by a company that’s become well known for raising the bar of optical excellence. 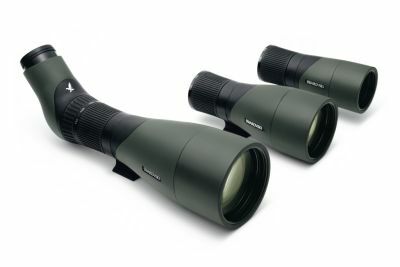 I can’t wait to take a look through one… but may have to wait a while… they will be available through specialist Swarovski Optik dealers from September 2012. Very clever and so simple. Would love to compare one with a similar sized objective standard Swaro scope. I purchased this scope from http://www.opticauthority.com/ and I must say I’m a happy user. Swarovski Optik always lives upto the expectation when it comes to spotting scopes.